While the earliest iterations of AI emerged in the 1950s, hardware limitations prevented the technology from reaching its true potential. Of course, the amount of processing power in our pockets today would have astounded scientists in that era, and advanced algorithms are allowing us to put it to work, combing through reams of data in seconds at the mere touch of a button. AI isn’t exactly real intelligence, but it is capable of spotting patterns buried deep within data sets that human eyes may or may not notice, and in a fraction of the time. Additionally, due to deep learning techniques, it’s capable of learning and improving over time, meaning it becomes more and more effective at its job. Thanks to this functional facet, AI is powering an exciting array of applications from investment strategies to autonomous vehicles. 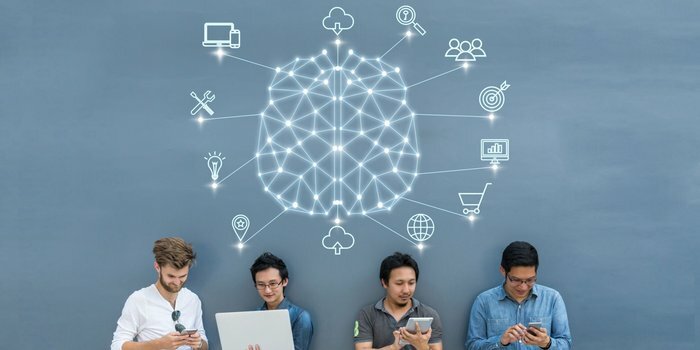 AI is sweeping through one industry after another, and while the technolgy is still in its infancy, it’s important to get started implementing now, so you don’t fall behind in the future. Rome wasn’t built in a day, so its safe to assume that implementation of AI technology won’t happen overnight either. To position your company in the sweet spot to grasp this incredible opportunity now, here are three steps to follow. 1. Cultivate an open culture. According to McKinsey, a profit gap is already emerging between early AI adopters and those who have yet to implement the technology. Unfortunately for the firms that are being left behind, catching up is more than the matter of purchasing new software. While the tempo of technological change is difficult enough to keep up with, the pace of cultural change is glacial. To take advantage of AI requires a team effort, which necessitates organizations build that culture of trust and openness to encourage collaboration. Encourage this kind of open culture now — for example, promote cross-team collaboration, invite process experimentation and redefine key performance initiatives — to foster positive attitudes toward technological change and AI adoption. 2. Partner with the pioneers. AI is on the bleeding edge of technological innovation, and the pioneers pushing it to the next innovative level are startups. These small companies aren’t going it alone, however. From financial institutions to automotive companies, large organizations are funding incubators and accelerators to nurture the next generation of startups whose technology will change industries. Working with startups has a couple advantages for bigger companies. According to Hossein Rahnama, founder and CEO of Flybits, “Joining up with a young company gives each entity a partner to lean on and grow with over the years.” He adds, “Through these partnerships, you’re not just procuring technology; you’re gaining access to talent, consulting services, new ideas, and more.” Working with small, agile startups provides an excellent launchpad for technology strategy and adoption. AI can crunch numbers better than anyone you could ever hope to hire, but it can’t do everything. It certainly can’t exercise creative problem-solving capabilities, and it’s still up to your employees to turn the insights AI unlocks into high-level strategies that drive business value. The issue is that many companies see AI as the remover of jobs, when really it is a job creator and efficiency upper. Instead of requiring a creative team to constantly multitask between crunching the numbers and strategy, use AI to perform some of the grunt work, and free up your creative teams to do what they do best. The initial implementation might make operations less efficient, but over time, your marketing and other creative teams will become much better at wielding the technology. With a bit of experience, they’ll aim it at the right data to determine your company’s next step in reaching its goals. As AI becomes more widespread, it will morph from a competitive advantage to the price of admission. To keep pace with the rest of the pack, start creating an implementation strategy today.